In writing about my appreciation of paving I’m fully aware that those who already think I’m a bit odd will think I’m even odder. But frankly I’m past caring. I first noticed the potential beauty of what was underfoot many years ago while walking into town on one of those miserable rainy mornings, when everyone’s trudging to work through the wet. 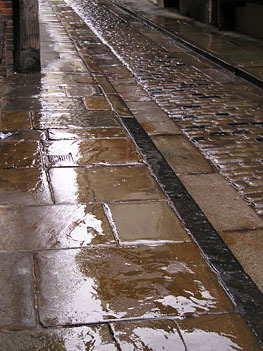 The little light available was reflected off the natural stone – perhaps of the type known as York stone, old and smooth and shining in the wetness. Rather like this stone, in the historic centre of York, on the Shambles. If you don’t think paving is important, imagine what the Shambles and other streets like it would look like if the local authority had just bunged down a load of tarmac. Here’s an example of a place I’ve always found charming, ‘proper York’, ‘real York’. Which is odd, as this could perhaps be anywhere. It doesn’t have any famous historic buildings. 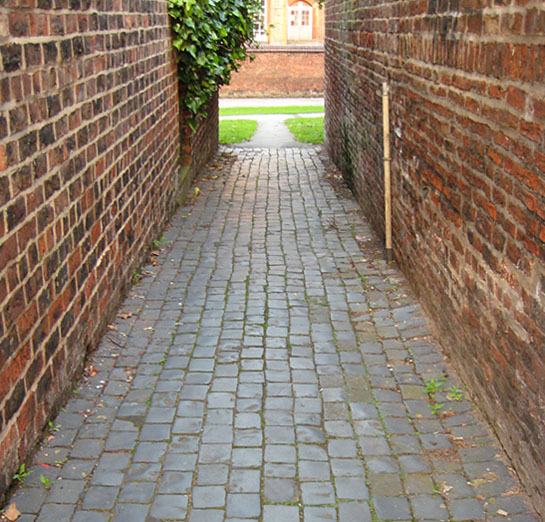 It’s a back lane, a wide back alley, with garages on one side, leading to a small group of Victorian houses, then narrowing to a slimmer access point leading to Scarcroft Stray and the school. It’s the textures underfoot, together with the brickwork, which make it photogenic. 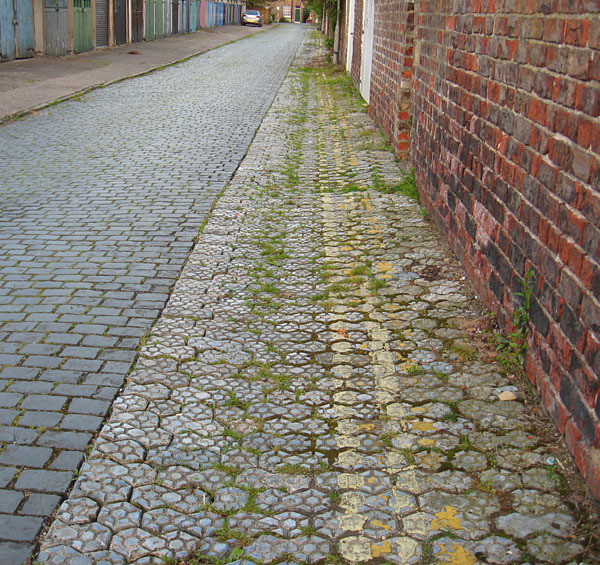 Though it is rather marred by the patch of tarmac and the yellow lines. 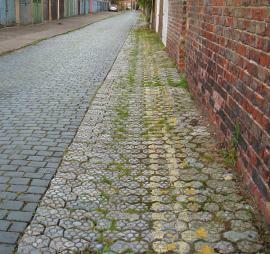 I’ve cropped the photo to miss off the jarring patch of tarmac, but couldn’t do much about the yellow lines. 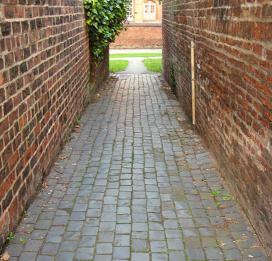 At its end, this narrow alley leads the eye between brick walls to bright sunlight and the grass beyond, where Audrey and her friends used to play skipping games, and today’s young people still lark about on the swings. This paving is pleasingly shiny and light-reflecting. This is even more obvious from the other end, which is the way I approached it, after visiting some of Audrey’s old haunts and taking a walk through the allotments she remembers. 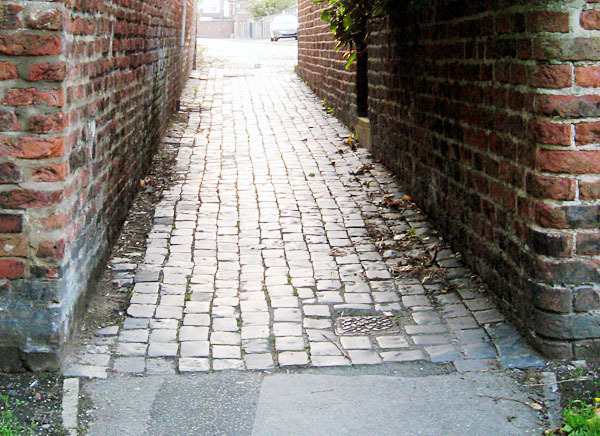 The patched up tarmac path in the foreground is dull and flat, absorbing the light. 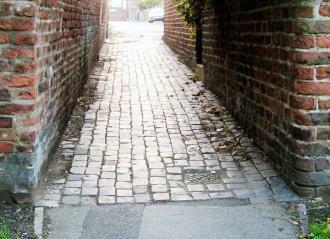 The old paving setts reflect the light, saying ‘Walk this way’, or perhaps, if you live round here, ‘Welcome home’. Just one of those things the walker notices, when wandering around, camera in hand.